Juice fasts have become increasingly popular but are they healthful? 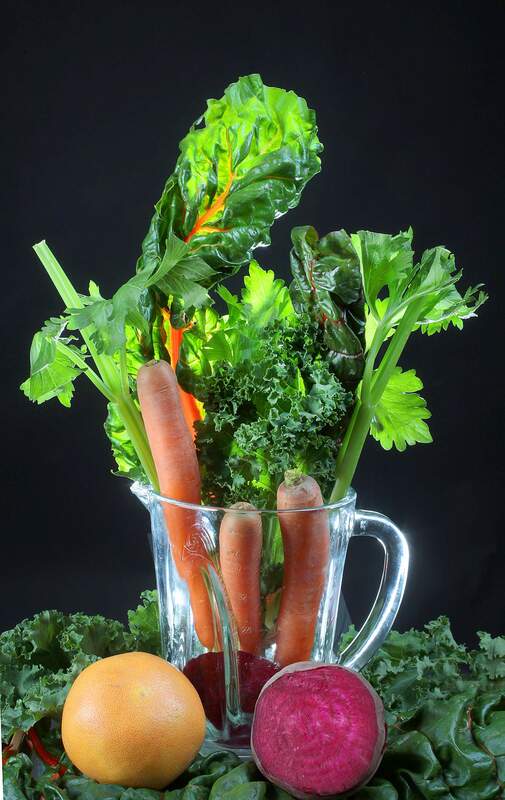 Vegetables such as carrots, swiss chard, celery, carrots, beets and oranges often are found in juice cleanse recipes, but for optimal health, Durango herbalist and microbiologist Anna-Marija Helt recommends eating them as part of a healthy daily diet. After the wave of holiday indulgence has left us beached on the sofa like sated sea lions, a radical dietary revision may seem just the ticket for our foundering figures. Enter the juice cleanse, which in many iterations looks something like this: Eat little, drink lots. The drinks in question are often green. The concept is that you scrub your innards with detoxifying compounds. One popular regimen, the Blue Print Cleanse, calls its most “intense” protocol the “excavation cleanse,” which consists of six bottles of preformulated juice consumed over six days. The program is designed to “flood your body with chlorophyll, restore your alkaline balance, and seriously rest your insides so they can finally unearth those crayons you ate when you were three,” the company’s website says. The parsimony of such a straightforward, ascetic solution to our heedless hedonism has propelled a vast industry of cleanse-related products. Blue Print’s plan to unearth those long-ago ingested crayons will set you back nearly $400. The Clean Cleanse (sort of repetitive, no?) wants $425 for chocolate or vanilla shakes that bear a strong resemblance to SlimFast. Despite the apparent popularity of cleanses, nutrition experts question their utility. She warned that some cleanses can actually do more harm than good. Many argue that today’s juice cleanse is just a repackaging of the age-old practice of fasting, which has been and remains an important rite of some of the world’s oldest religions. Catholicism’s Lent marks Jesus’ 40 days of fasting in the desert before launching his evangelistic career. During Ramadan, Muslims avoid food or drink between dawn and dusk. Buddhists also fast to achieve greater spiritual clarity. The concept began to achieve secular acceptance in the ’70s with the publication of Stanley Burroughs’ The Master Cleanser. While the diet’s aims are corporal, Burroughs talks about it in religious terms. “At last a new field of healing has been brought to the world and for those who would listen and believe a new knowledge will set them free from the slavery of false conceptions,” he wrote in the introduction to the book. Nobody questions the diet’s weight-loss potential – starvation will do that to you. But few nutrition experts buy its claims of promoting better long-term health. The herbalist Helt said the diet and its ilk actually cause toxins to build up in vital organs. This is because the body, deprived of fuel, burns fat, releasing the toxins stored within. But the liver needs the amino acids found in protein to carry those toxins out of the body. Without those, toxins accumulate in the blood and organs kind of like smog over Beijing. Rather than detoxing, the cleanser in question has become intoxicated. “Living an unhealthy lifestyle with periodic cleanses thrown in to try to clean up is neither useful nor sustainable,” Helt writes on her website. In a November article in the online magazine Slate, writer Katy Waldman called serial juice cleansing anorexia in disguise. “Both cleansers and people who struggle with disordered eating show a tendency toward enfolding their dietary choices in myths and religiosity, poetry and rapture,” Waldman wrote. Like the Catholic church’s 16th century practice of selling indulgences, expensive juice cleanses place optimal health and spiritual purity solely in the purview of the affluent. “Unlike timeless forms of salvation, salvation by vegetable goop is only available to the well-heeled,” Waldman wrote. Amita Nathwani is a local practitioner of Ayurvedic medicine, which originated in India and relies heavily on diet to heal the body’s ills. She said she sees a spike in interest in cleanses after the New Year, but this is not the right time of year to take up such a program. “We don’t recommend doing cleanses in the middle of winter,” she said. The best time is spring, when fresh greens begin to become available. Unlike juice cleanses, the regimens Nathwani prescribes include simple, easily digested foods such as kitchari, an Indian dish made of rice and mung beans. Ghee, a clarified butter common in Indian cooking, provides a source of healthy fats. Helt, too, recommends cleansing not by juice fast but by eating lots of fresh fruits, vegetables and lean protein such as lentils. “The bitter greens available in the spring facilitate the expulsion of wastes by promoting liver and kidney function, by enhancing digestive function and by providing vitamins and minerals to boost overall body function,” Helt writes on her website. Local pediatrician Kristen Roessler has employed twice-annual cleanses for several years to achieve optimal health. Her cleanses usually last 21 days and entail eating lots of fruits, veggies and lean proteins while avoiding toxins (caffeine, alcohol) and allergens (wheat, dairy). As a trail runner and mother of three boys, she said she needs a diet that allows her to maintain her stamina. “I can’t really do something that restrictive,” she said. Local experts acknowledge that the diets they recommend as cleanses often are just hyper-healthful eating. For this reason, there’s no harm in incorporating them year-round.